Every year, I will look forward to receiving the Mooncake Agar Agar from my mum’s friend who makes really delicious mooncake agar agar. 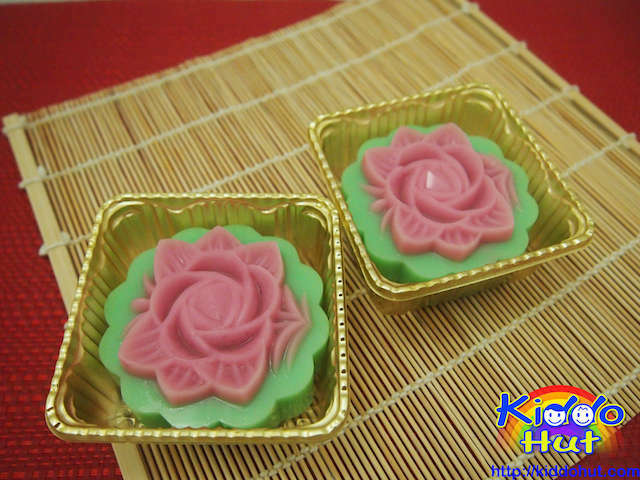 Mooncake agar agar is agar agar (jelly) filled with the lotus seed paste filling and moulded into the shape of a moon cake. I love agar agar, I love lotus seed paste, a combination of these two made me drool. Each year, I would give the traditional baked mooncakes to friends and relatives. This year, I decided to beat the tradition and give them the home-made mooncake agar agar instead. What could be more sincere than making the gifts myself, I was determined to make the mooncake agar agar. Improvised from the original recipe verbally given by my mum’s friend, I have tried a couple of times before I found the right quantities of the ingredients that give the right texture – not too wobbly and not too hard. Beside the lotus seed paste, I have also used my next favourite filling – durian paste. There are many types of fillings available but I still prefer the traditional filling. Tomorrow is Mid-Autumn Festival (中秋节) a.k.a. Mooncake Festival or Lantern Festival. Wishing everyone a happy festival! 1. Divide the lotus seed paste into 11 portion and use hands to mould it into oval shape and flatten to about 1cm height. Ensure it can fit into the mould. 2. Use the mould to measure the amount of liquid required to fill the top pattern. In my case, I need 20ml for each mould. 2. Dissolve the agar-agar powder and sugar in water. 3. Add the bundled pandan leaves and bring to boil under medium-low heat. Stir while bringing to boil. 4. When boiling, turn down the heat, add the coconut milk and a pinch of salt. Stir continuously until boil. If you do not stirred continuously, you may get 2 layers of colour later. 5. Remove the pandan leaves. 6. 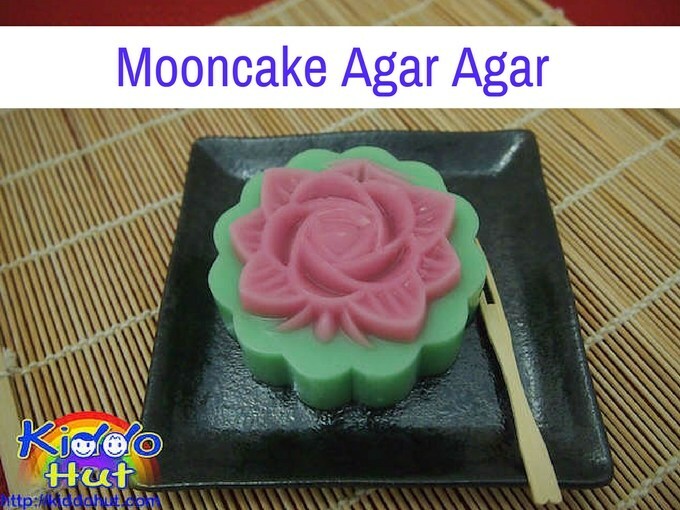 Divide the agar agar liquid into 220ml (20ml x 11 moulds – for the top pattern) and add 1-2 teaspoons of rose syrup. Adjust to your colour tone preference. For the balance liquid, add the green colouring. While you add the colouring, continue to stir. 7. Fill the top pattern with the pink liquid and wait for it to harden slightly. 8. Put the filling then pour the green liquid to fill the mould. 9. Let it cool at room temperature before putting into the fridge to chill. Remove from mould and serve.